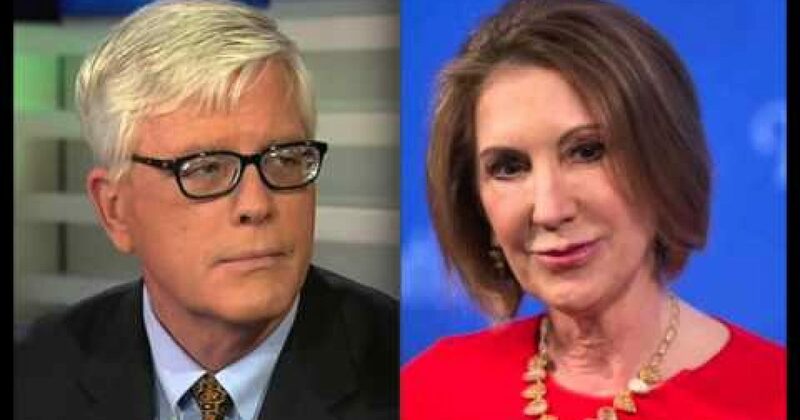 GOP presidential candidate Carly Fiorina was a guest on the Hugh Hewitt radio show Monday evening, and the discussion turned to the Center For Medical Progresses Planned Parenthood videos and the failed senate vote to de-fund Planned Parenthood. Fiorina said that during the budget process in September, the GOP should hold their ground and hold back funds from Planned Parenthood, and let the Democrats close the government down by filibustering the appropriations bill. But they have to build up to it. Below is a transcript and audio of the entire segment about Planned Parenthood. Hewitt: And kept it after she left, which is the second violation. I mean, it’s actually kind of staggering that there isn’t a special prosecutor already appointed for her, but I, like you, am skeptical. Now let me ask you about the Planned Parenthood videos. Have you watched them, Carly Fiorina? Fiorina: I have, and it’s almost unbearable to watch. Fiorina: It’s almost unbearable. And as I have said many, many times, this is not about whether you think you’re pro-choice or pro-life. This is about the moral foundation of this nation. It is an abomination. Truly, it is depraved, and I hope very much that Congress will vote to defund Planned Parenthood now, but I hope as well that every Democrat running for president, for Senate, for Congress or for dog catcher is asked to explain why they are not condemning this practice, these videos, and voting against the funding of Planned Parenthood. Hewitt: Now Carly, it will come down to shutting the government down, again, on this issue. And that’s where we’re headed. We’re headed there in September, September the 30th. The government will run out of money. The Republicans will refuse to fund Planned Parenthood. The President and the, well, the Democrats in the Senate will refuse to pass an appropriation bill. Should the Republicans blink at that moment? I want to get people ready for this right now. The Democrats will never give up on the abortion industry. You and I both know that. So should the Republicans be preparing now, and educating the American people that they will do what it takes to end what is in essence support for infanticide? Fiorina: Well, I certainly hope that the Democrats in Congress and in the Senate will be asked the question over and over and over again. I will certainly continue to ask the question of Hillary Clinton and anyone else. So will you. I hope every Republican does. I hope every media outlet does. Explain to me, explain, more importantly, to the American people how you can continue to support a policy that it isn’t a life until it leaves the hospital, and how can you continue to support taxpayer funding for this organization. We have to hammer away at that. Ask them the question. Hewitt: Now, you know, though, Carly Fiorina, I’ve probably interviewed you 30 times. You’re one of the best interviews out there. I tell people that’s because you did quarterly conference calls on earnings for so long. But that’s the first time I didn’t get a direct answer from you. Maybe because it’s a very difficult question, so I’m going to try it again. If it comes down to closing the government down or funding Planned Parenthood, what should the Republicans in the Congress do? Fiorina: I apologize for not answering your question. They should close the government down. Fiorina: My point is this, however. We have a long way to go. And between now and then, beginning with this vote today, every single Republican out there, as well as I hope every media outlet, needs to ask the question that I have been asking for weeks. How does any Democrat justify their position? How does any Democrat justify the continued taxpayer funding of this organization? And if you really think it’s necessary, then why don’t you support taxpayer funding for pregnancy centers right next door to every single Planned Parenthood facility across this nation so that women really understand what their choices and their options are? We have to hammer the Democrats on this, because honestly, their position, which most Americans do not understand, that’s the shame of it. Most Americans don’t understand that the Democrats’ position is it’s not a life until it leaves the hospital. Most Americans don’t agree with that position. We have to educate the American people about how extreme Democrats are. Hewitt: Now Planned Parenthood’s defense is that the videos have been edited. What do you think about that? Fiorina: Yeah, yeah, well, I didn’t hear anybody getting upset at an edited video about Mitt Romney at a fundraiser. Look, whether they’re edited or not, and by the way, the people who have made these videos have also put the unedited videos out there for everybody to see, so if you want to watch the whole thing, you can. This is not about editing. This is about a horrific process of infanticide to harvest body parts. It is abominable. Hewitt: Do you think the DOJ ought to, we’ve been talking a lot about the Department of Justice, last question, there ought to be a special prosecutor looking into this as well, about some of the attorneys general in the states are going after Planned Parenthood, but it does appear that they have violated numerous laws. Fiorina: Of course, there should be, and my guess is there will not be, because the Department of Justice is, as we’ve talked about before, politicized. But I applaud the attorneys general across the country who are conducting their own investigation. It has to be done.